In our last couple of community farm boxes we’ve gotten a supply of hearty winter vegetables, most recently squash, leeks, and spicy greens. 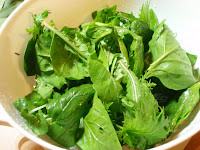 The first time we received the mixed greens (mizuna, red/green mustard, arugula), we were clueless as to how to use them and had to rely on the recommendations of the farm for how to prepare them. We tried the greens in a salad, but I thought they were too “stemmy.” Then I put them in a stir fry with chicken and veggies, and they were right at home in the sweet and tangy ginger sauce. But there’s only so much stir fry I can eat. I wanted a simple dish that could combine all these ingredients without “forcing” them together. The leeks would be the easy part. Risotto seemed like the best way to do this and still preserve the flavor of the vegetables. The result is a stick-to-your-ribs dish perfect for fall. It’s kind of healthy, too. 1. Prepare squash. Preheat oven to 350° - then chop the squash in half and place it on a baking sheet that is either greased or covered with parchment paper. Roast for about 50 minutes or until flesh is tender. Let cool and remove the skin, then chop or mash the squash. Set aside. This can be done a day ahead of time for convenience. 2. Heat olive oil in a medium sized pot, add garlic and cook for one minute, then add leeks. Sauté for about 5 minutes, or until leeks become tender. 3. Add rice and salt, stirring well. 4. Add wine and reduce heat to low. 5. After the wine has absorbed, you can begin adding the stock. 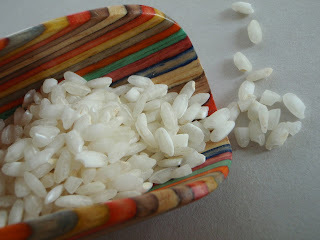 You’ll want to do this in small amounts, waiting until the liquid is absorbed by the rice before adding more. You’re shooting for about 30 minutes of cooking time, stirring often. 6. When you’ve added about half of the liquid, throw in your squash to let it heat thoroughly and soften a little more. 7. Upon adding your last stock to the risotto, stir in your greens and let them wilt. 8. Top with cheese and serve. For a creamier risotto, shred extra cheese and stir in to melt before serving. 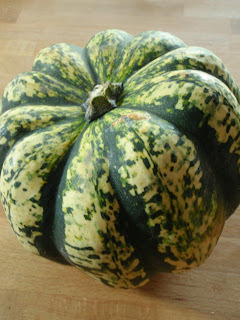 *There are many varieties of winter squash, all with very different colors, shapes, and taste profiles. The Sweet Dumpling is generally on the smaller side, and has a creamy, golden flesh with just a hint of sweetness to it. Helpful Hint: Buy your Arborio rice in bulk, it’s a lot cheaper. Sometimes by half of what you might pay for the boxed stuff.